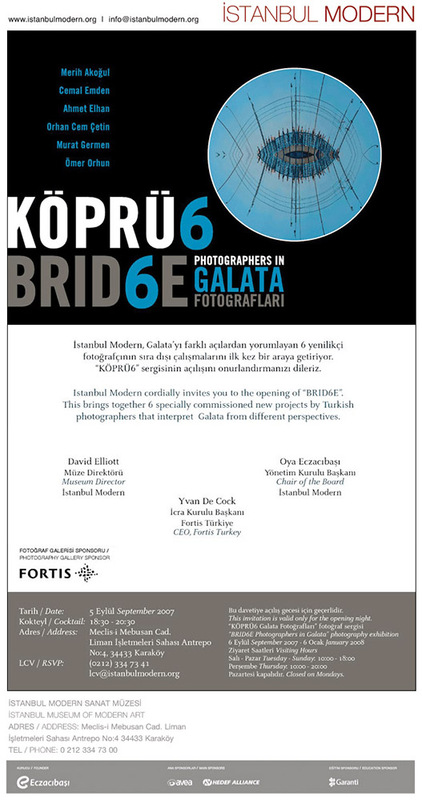 On 6 September 2007, Brid6e – Photographers in Galata will open in the Photography Gallery of İstanbul Modern. Curated by Engin Özendes, the exhibition will include recently commissioned works all focusing on the subject of Galata Bridge by young Turkish photographers Ahmet Elhan, Murat Germen, Cemal Emden, Orhan Cem Çetin, Merih Akoğul and Ömer Orhun. Considered among the most outstanding and innovative names in Turkish photography, these six photographers, who all work with a strongly conceptual bias, have approached Galata and its neighborhoods from perspectives that are diametrically opposed to the usual photographic cliché. In the projects they have specially developed for this exhibition, not only have they aimed to reflect the historical significance of the area and its associations for Istanbul, but they have also sought to expose the impact of changing living conditions and the diversity of urban development on the area in an attempt to generate fresh understandings of Galata and its significance. These works reveal the different ages of Galata, its multicultural past, architectural characteristics, and inimitable way of connecting East and West as a crossroads or junction between different urban realities. These works range from photographs that compress different moments on Galata Bridge into a single frame, to collages that recreate its multicultural history through reference to both visual and literary materials; from wide, panoramic images running wall-to-wall, to installations that focus on different aspects of interior space. With Time Present Time Past, that opens at the same time, Brid6e brings together two monumental symbols of this ancient city: the Bosphorus and the Golden Horn. In this respect the exhibition presents a series of individual interpretations of the themes of Architecture / City / Connection / Time on which Hou Hanru, the 10th Istanbul Biennial’s Artistic Director, will be focusing. By way of setting the scene, the introductory wall carries a facsimile of the letter Leonardo da Vinci addressed to Sultan Bayezıt II in 1502, offering his services to build a bridge over the Golden Horn, as well as reproductions of his resulting drawings, the originals of which are kept in the Topkapı Palace. These will be supplemented by a reproduction of the drawing for the first Golden Horn Bridge built in 1836, 334 years after Leonardo da Vinci’s version, and a collage of a panorama including Galata Bridge, which the Sebah & Joaillier studio photographed in the 1890.